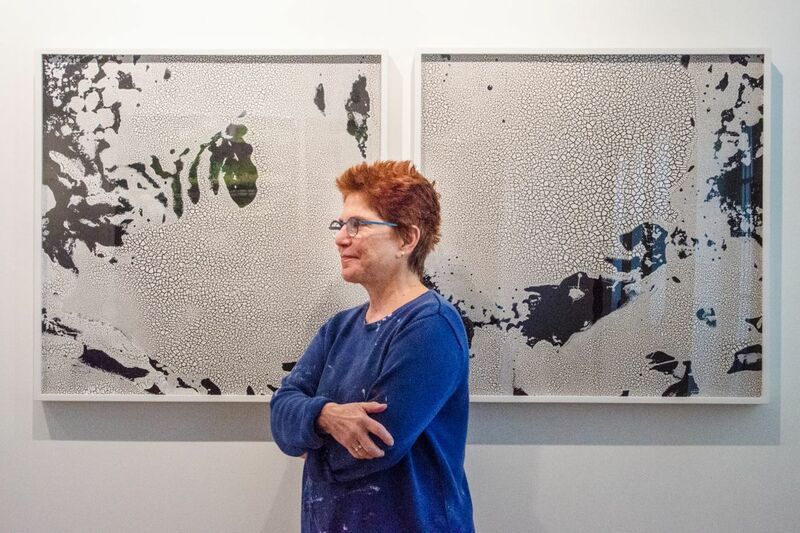 Portrait of Diane Burko, who explores the intersection between art and the natural environment, in her studio. Diane Burko never intended to be a climate-change activist. But in 2006, while speaking at the James A. Michener Art Museum — where her 1976 painting of the French Alps was displayed — she had a eureka moment. She wondered: Is the snow still there? "And that set me on my path," Burko said. "I started studying and finding out where the snow was and if it's melting." She used a practice of geologists called repeat photography, in which a glacier is shot from the same point of view at the same time of year for 30 to 60 years. Then she painted them. This is how we know that at one time Glacier National Park in Montana had 150 glaciers but today has fewer than 25. Yet after spending a decade documenting the dramatic disappearance of glaciers — her book on the subject, Glacial Shifts, Changing Perspectives: Bearing Witness to Climate Change, was released in April — Burko, of Center City, is now shifting her sights to barrier reefs. Funded by a nearly $40,000 grant from the MAP Fund, a philanthropic grant program, her new project aims to raise awareness of the changes in barrier reefs, such as coral bleaching — in which coral respond to warmer temperatures by expelling the colorful algae that live within them. Some coral recover, but too often the coral dies, and the entire ecosystem virtually disappears. "I believe there's a way to reach people about issues of climate change without hitting them in the head with charts and graphs, because sometimes it just goes beyond them," Burko said. "As an artist, my language is aesthetics. If you can combine art and science, you reach a different audience." Called Kai 'Apapa, Hawaiian for "coral reef," the project will be a multimedia examination of American national parks' nine coral reef systems. A team — NASA earth and space science fellow Samiah Moustafa, composer/video artist Christine Southworth, and composer/clarinetist Evan Ziporyn — will join Burko to study the health of the reefs through music, video, photographs, and paintings of each park. Culminating in a live performance for theaters and planetariums, the project will premiere at the Boston Museum of Science in fall 2018. "In the last 30 to 40 years, 80 percent of coral in the Caribbean have been destroyed, and 50 percent in Indonesia and the Pacific," said Burko. "The 1997-98 El Niño alone wiped out 16 percent of all coral on the planet. Globally, about 1 percent of coral is dying out each year." At the Walton Arts Center in Fayette, Ark., which will host a show of Burko's work until the end of September, consulting curator Andrea Packard called her work important "because it helps us imagine things outside of our experience in ways that are engaging and not off-putting. "We're living in a time where climate change is a factor that's immediate and obvious, but we still have a number of people of influence arguing that it's not caused by human interventions in the environment." For her work, Burko traveled in 2013 to Svalbard and Ny-Alesund, close to the North Pole, and to the Antarctic Peninsula; in 2014, she went to Greenland's Jakobshavn and Ilulissat Glaciers; and to Antarctica again and Argentina's Patagonian ice fields in 2015. Joe Yohlin of Dresher added Burko's work to his art collection in 2008 and now owns eight pieces, including two diptychs. In one, the Arapaho Glacier in Colorado's Roosevelt National Forest from 1960 is painted on one panel; the other shows the glacier from 2009. "The fascinating thing is that the picture from 1960 is grey, black, and white and very drab," said Yohlin; the one from 2009 has beautiful blue water and a colorful sun baking off the remaining glacier. "It's the irony that the drab, ugly scene was representative of a healthier environment and the beautiful scene is actually the one that becomes more haunting." He said he most appreciates the integrity behind Burko's works, which range in price from $2,000 to $50,000, "and the efforts she makes to travel to remote regions of the world to learn." Still, Burko is excited to begin a new chapter with barrier reefs. "This new world and subject matter will expand my color vocabulary again, providing new aesthetic challenges."